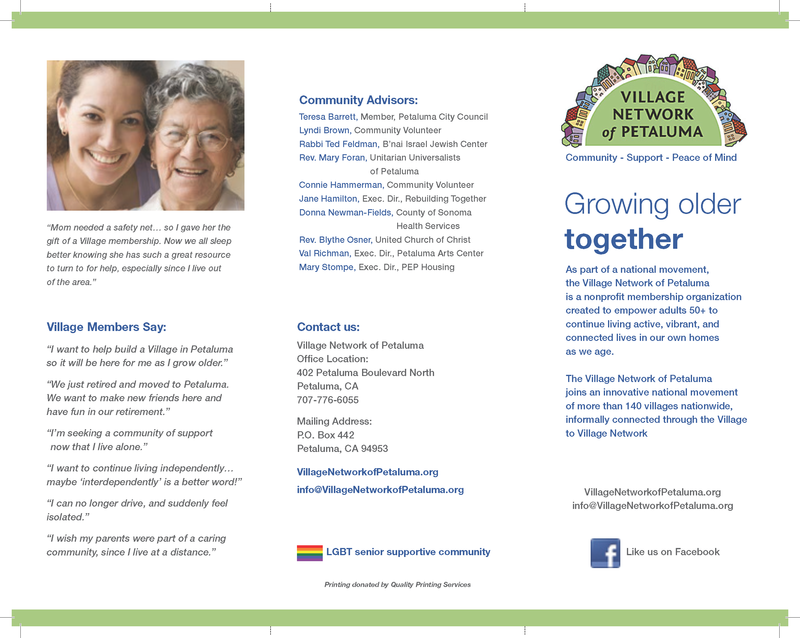 We are a group of volunteers who worked together to establish the Village Network of Petaluma as a non-profit, community membership organization to empower adults 50+ to age affordably in their own homes for as long as they can, as well as they can. The Village Network was then launched in June, 2014. 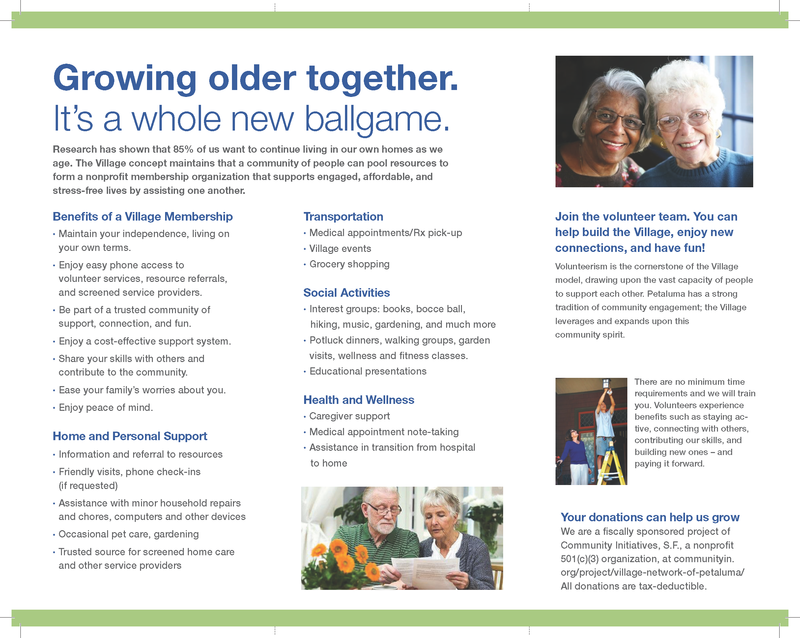 Villages are member-driven, and primarily supported by fees from their members. Think relationships, collaboration, sharig, suport, and peace of mind. The Village model is a way of life, not a place: "neighbors helping neighbors." The village model has been successful in more than 230 other communities in the U.S., and we are drawing from their experiences. There are over 29 Villages in the Bay Area, and more in development. We are the first in Sonoma County! Members call one number for resource referral, home visits, social events, computer help, minor household repairs, transportation, pre-screened service provider referrals, and opportunities to share one's special talents within the Village. Our intention is to work in collaboration with existing community organizations to strengthen affordable services for seniors and increase the "aging-friendliness" of our community. "Aging should never be a solo game"
These are core values for all our interactions with each other, our members, volunteers, and the community. We are committed to creating a stable and sustainable nonprofit organization,in a way that also supports our energy, interest, and ability to contribute. It is our intention to promote caring relationships, and to form a Village Network that contributes to our community and benefits others as well as ourselves in a meaningful way. We give what we can, avoiding over-commitment. We also encourage a balance between giving and receiving, contributing our talents and energy while nurturing our own well-being. We value competence in our work, committing ourselves to a high level of service. We are committed to working harmoniously and cooperatively with each other, willing to compromise and seek win-win approaches to problems. We place a high value on collaboration with other community organizations. We are working toward creating a village which reflects the diversity of our community. We are creating a nonprofit membership organization which will be here for all of us as we age. All are important as we build our community! We remember to appreciate each other, our volunteers, and members often! The purpose of a Village is to empower adults 50+ to live affordably in their own homes for as long as we can, as well as we can, engaged with a trusted, fun, and supportive community of people. This concept is inspired and supported by the nationwide Village To Village Network (VtV), a national peer to peer network to help communities establish and continuously improve management of their own Villages. In 2012, our founder and Steering Committee Chair, Anne Greenblatt, attended a national conference on the Village model, an innovative idea that has been spreading rapidly across the nation. She began meeting with local community volunteers and service providers, and the Petaluma Village Exploration Project was formed. Since then, monthly meetings for the public and committee meetings for those who have joined in the effort to form this organization have moved the project forward. Meetings with community organizers, senior service organizations, and Villages in other neighboring cities have brought us to the realization that many in the Petaluma community share our interest. We are now the Village Network of Petaluma, with 501(c)(3)nonprofit status. We found a light, airy (and low rent!) space at 402 Petaluma Blvd. North. On June 7, 2014, we had our grand opening with a wonderful show of support from our community and now are continuing to grow with that support. We have worked with community volunteers and organizations in Petaluma to discover gaps in services and community needs. We have learned from older adults and senior service providers that the most pressing needs are: comprehensive information and referral services, systems navigation, transportation, friendly visits and addressing isolation, as well as fraud prevention. Many people have agreed that there is a need for an affordable, self-help community of older adults who can provide guidance and assistance in the transitions of aging, and a way to stay actively connected to the Petaluma community. We hold meetings and living room chats for people interested in learning more and contributing their ideas. For details, please Contact Us! We welcome volunteers and members! Your help and ideas are always welcomed, as we work together to build a thriving Village Network here in our community.